Back in September, I had the pleasure of photographing Hannah's maternity shoot (another blog post on that soon!) and also visiting her in her studio space at Halton Mill. For those of you that have known me for a while, you'll know that my background is in Fine Art and I was super-excited to see Hannah's work and space. Hannah was a dream to photograph and she's someone I admire on so many levels for being the creative, intelligent and independent mama that she is. Her work is deeply personal and raw and that's the kind of painting that I like. 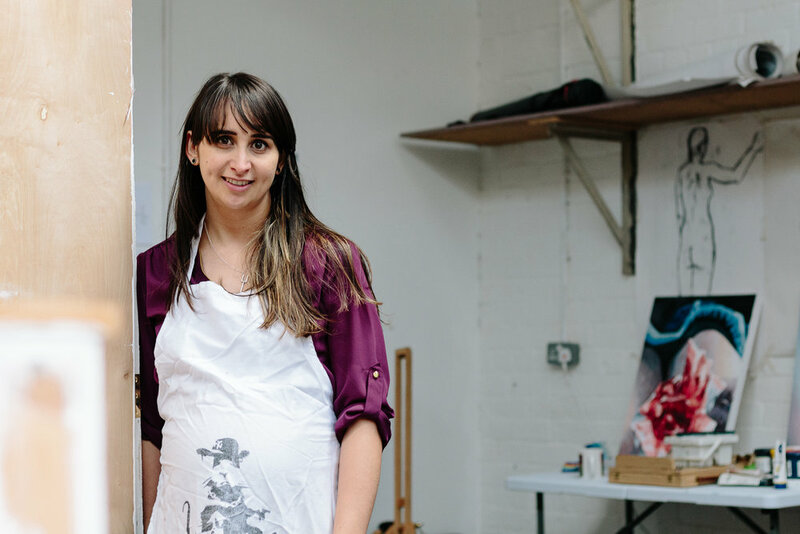 Because Hannah's words are better than mine to describe her work and process I've included a Q&A here alongside the photos I took of Hannah in her studio. 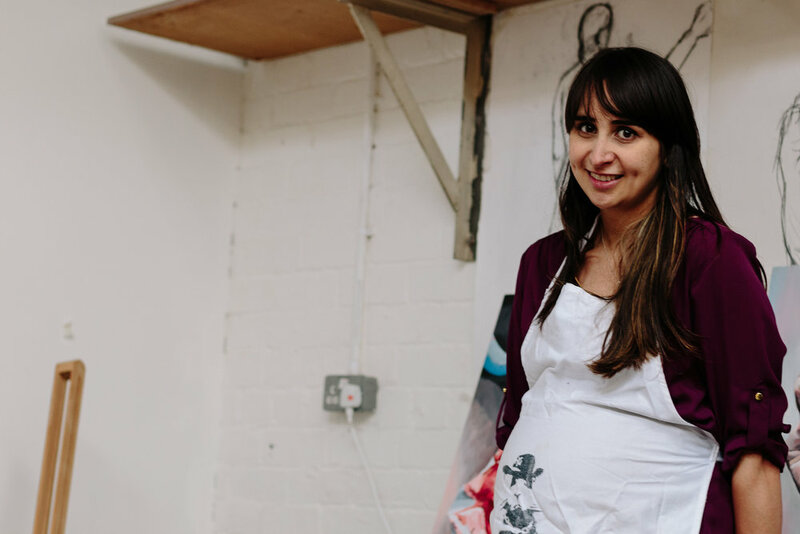 I really love connecting with independent creatives and would really like to make Q&A's a regular feature on Morganna Designs, so if you're after some artist head-shots (my current rates are here) and would love to share your practice here, get in touch and let's make it happen! My work deals with women's health issues, specifically around menstruation and infertility. It's a topic that is often shied away from, something not often talked about, but I believe that's what makes it such a rich topic to explore. It also means that people tend to have a strong emotional reaction to my work. Who / What are you inspired by? I was inspired to start this project following my own struggles with endometriosis, a disease which is the leading cause of female infertility, affecting over 176 million women worldwide. After being diagnosed, I started researching the condition only to find that despite its wide reach and the life changing implications it can have for women, there has been very little research into the cause, and there is still no cure. I started using this as the central topic for my work to bring attention to the issue as well as to deal with it on a more personal level. I've been an artist ever since I can remember, and have always had a fascination with the human form. I paint because I love it; I couldn't imagine doing anything else. It's also a powerful tool for me to deal with issues in my own life, and to think about things in a different way and come to new understandings. 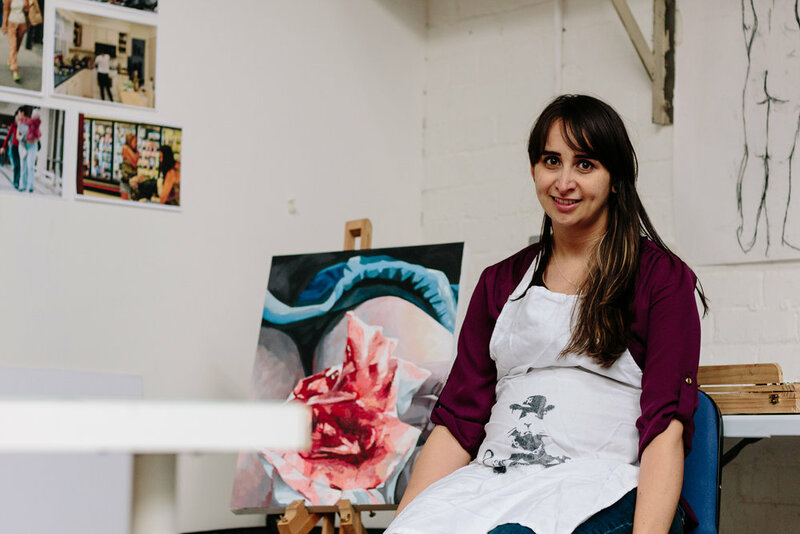 What’s it like to have a studio space at Halton Mill? I am really lucky to have a great studio space at the Mill. 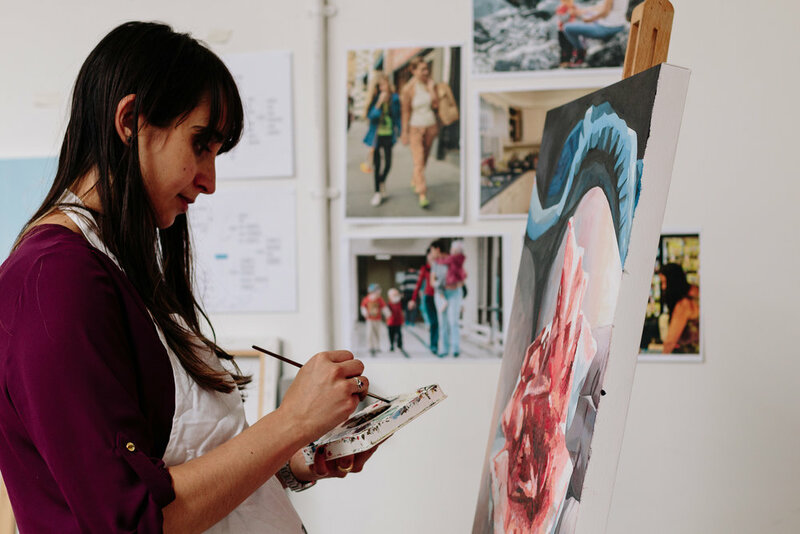 It's a beautiful building and a lovely environment to be creative, and it also gives me the opportunity to work alongside other fantastic artists and creative folk who I wouldn't otherwise come across. You’ve recently become a mum, has that affected your creativity / your work / plans? It's been five weeks now and I haven't managed to get back into the studio yet! But it hasn't changed my plans, and I'm looking forward to getting back to my practice once we're a little bit more settled. Because of the themes that I work on, going through pregnancy and having a child has given me plenty of new perspectives on the topic, and I am sure will enrich the work that I produce over the coming years.